Converting an office space into a home is no easy feat. We know this all too well from our own experience of transforming our very first office space into a stylish residential home. The wonderful office space in Chelsea was the birthplace of th2designs and the home of our first interior design practice, Taylor Howes Design, for over 20 years. Fast-forward to 2016, and with Taylor Howes based in glamorous Knightsbridge and th2designs in a cutting-edge studio in Chelsea Harbour, our lovely old offices (which always looked more like a little house from the outside) were crying out for some TLC. So we applied for planning consent and began the journey of transforming the space into a beautiful new home. We learnt a lot along the way and wanted to share some of our top tips with those of you embarking on a similar adventure. Get your planning permission in place! Green is a firm favourite for this season. It reflects an organic and earthy autumnal vibe and can look just as great in a block-coloured dress as it does on a sofa. Green used in interiors has a timeless feel and the deep forest green and bluey tinged teals are two of our favourite shades. If you pop into our Chelsea Harbour Studio you will see our brand new room set, an autumnal library space, where block colour blue-green walls are the perfect matching backdrop to a huge teal upholstered seat. This can be a long and arduous process. You will need to have the time and funds to cover this and any professional help you might need to guide you through the process. You can find more information about planning permissions here. Look at the features you have to retain and work out how you can give them a more residential feel. For budget reasons we had to keep the metal spiral staircase that ran through the core of our building - by painting it a fab colour and softening the treads with a woven flooring, the staircase has become the most striking part of the refurbished house. Before you make any alterations, you need to work out <em>who</em> you are designing the new residential property for so that you appeal to the right potential market. What sort of people live in the area? Is it likely to be a family home? What is the spending power of most locals? Work out what budget you have to spend on the conversion and focus the lion's share on giving the house a great first impression. Try to get inside the head of whoever might live there and how you can give them multi-functional spaces. Think about living, sleeping and entertaining. Consider storage and flexible spaces that work for any new homeowner. The way a space is designed for a home is very different to an office space so it's important to keep the purpose of the space in mind. We transformed two office and two cloakrooms on the first floor to create a 5-star hotel feel to the master bedroom suite with double doors leading on to a private space with a large master bathroom, two walk-in dressing areas and a generous bedroom. We believe the person paying the bills should have the best room in the house! Modern living means that ideally, a kitchen is big enough to live, eat, work, and socialise in. We knocked through a small office kitchenette, comms cupboard, and office to create one space that is large enough for a good-sized working kitchen, family table, and seating in a corner. Most people buying a home would look for a garden or terrace yet most offices do not have outside space. You need to be creative - we transformed a small side passage into a little garden off the kitchen which is accessed through a new glazed door we punctured through the existing wall so that even when the weather is bad you can see a glimpse of green. With a little astroturf, a few plant pots and a cafe table and chairs you have a little garden that looks good and is low maintenance! 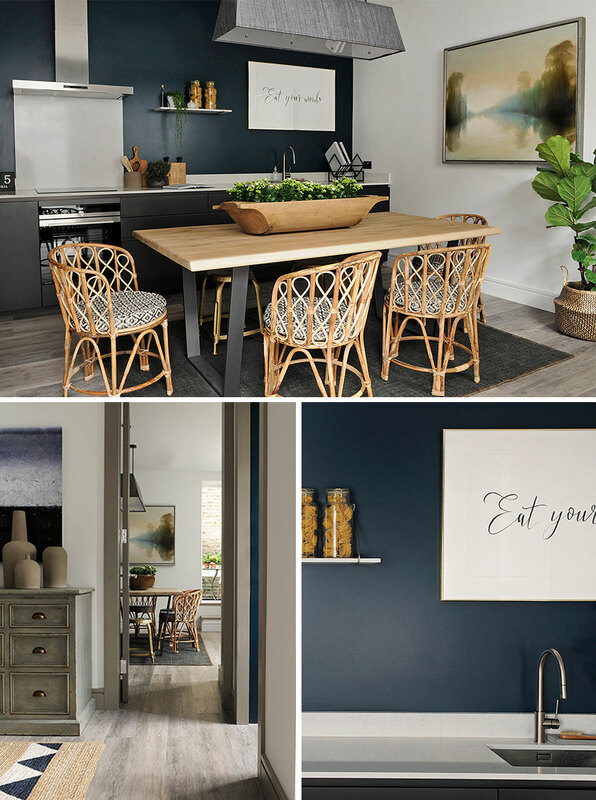 Put together a mood board or Pinterest board with your favourite images so that you have a clear vision of how you would like the whole house to look once it is converted. Do you want a townhouse, country house, something traditional or a very contemporary home? By collecting a variety of imagery that you find appealing you can begin to narrow down what kind of style you are going for and what works well together. Browse our portfolio of residential interiors for more inspiration. Office schemes tend to be rather stark, often just pure white walls. You could try adding soft inviting colours in your paint selection with a darker tone on the doors and skirting for a more unusual look. The occasional use of wall coverings will make a fundamental change to the feel of the room so try this in smaller spaces (like the cloakroom) or key rooms. If your budget runs to it, employ a lighting designer. Commercial lighting is very different from what you would want in a home and the experts will be able to give you the best advice that will save you from making any expensive mistakes. You will probably have to allow room in your budget to change all the floorings - office carpet tiles just won't cut it in a new home! Use tactile flooring to create a flow from space to space, with a mix of timber, carpet, and stone, with different textures but blending tones. Inserting carpet into hard flooring adds a touch of comfort to a living space and can reduce costs. If your budget runs to it furnishing the property will make it feel like a real home. If you do not have the know-how or time to do this we have launched a new online company th2studio-LINK where you can simply click and buy fully furnished rooms and individual pieces, designed by the experts and delivered to your door.